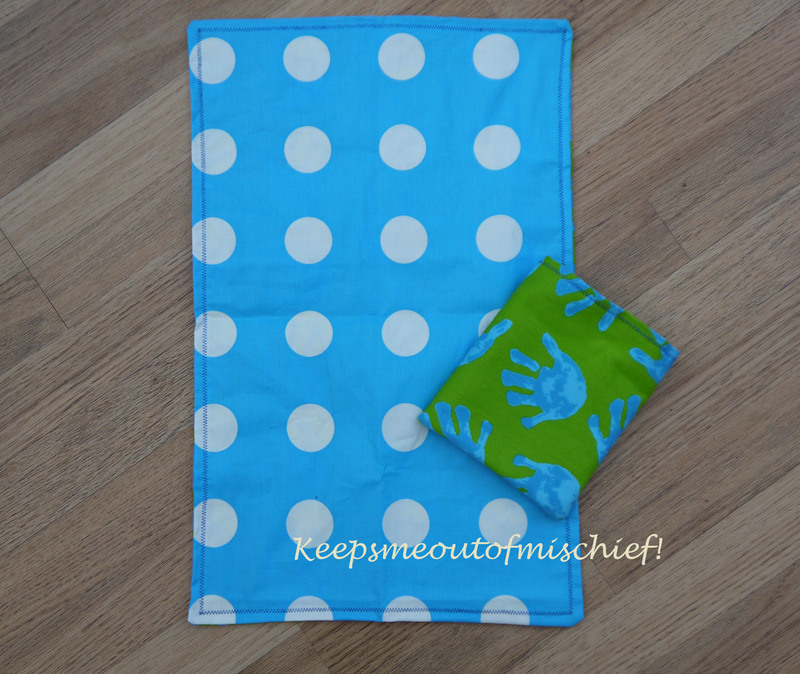 Travel Changing Mat | Keeps Me Out Of Mischief! I know that seems like a slightly strange thing to call this project as by their nature, most changing mats sold in changing bags are fairly portable, but needs must! I’m fed up of carrying around a massive changing bag and I don’t need to carry around so many things for Billy now he’s a bit older and his food can go in his lunch bag. I bought a small rucksack from Trespass that’s like the Dr Who Tardis. It looks small from the outside but I’ve managed to squash in a change of clothes, a couple of nappies and pack of wipes, a bottle of sun tan lotion, a hat, a snack pot and a drink. The only thing that was missing was a changing mat. I’m a bit funny about using communal changing mats in public places and would rather I had something to put over it as I’m never sure how clean they are. I decided to make this thin changing mat from two rectangles of fabric which measured 35cm by 65 cm. I didn’t put any wadding in as I didn’t want to add bulk and the idea is that I will always end up using it on top of another mat. It won’t harm him to have the odd change in less than 5 star comfort! The little bag was made from the same fabric as the backing and the mat just slips into it. Perfect!